The aquarium is one of the best decorations for your home, however, aquariums are expensive and require proper care. If you don’t have the place to put an aquarium in your home, you might want to consider using a virtual aquarium on your PC. There are all sorts of virtual aquariums available for your PC, and today we’re going to show you the best virtual aquarium software for Windows 10. What is the best virtual aquarium for Windows 10? Dream Aquarium is a virtual aquarium that offers beautiful graphics and many great features. The application offers several different aquariums that you can customize by adding different species of fish. We have to mention that fish behaves similarly to real fish and they’ll swim together or chase other fish. Speaking of fish, each fish has realistic movement and behavior along with articulated fins, fills, and mouth. The aquarium looks realistic thanks to the shifting light rays and moving plants. We also have to mention that this virtual aquarium has 27 species of fish that you can add. 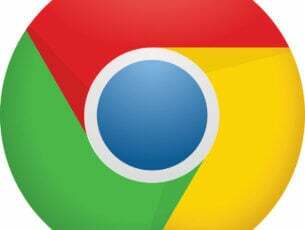 The application supports the widescreen format and it can even work on multiple monitors. Regarding the configuration, you can switch between different aquariums and adjust your monitor settings. You can change the location and speed of bubbles and adjust the light rays. If you want, you can even zoom in and follow a specific fish or a random fish. The application also allows you to change your background and customize your aquarium. Of course, you can feed your fish at any time, but if you’re forgetful, you can use automatic feeding option. If you’re not pleased with your current screensaver, you can use the Dream Aquarium instead. This virtual aquarium offers great graphics and a wide range of features, so we advise you to try it out. You can download the free demo, but keep in mind that the demo version doesn’t allow you to save changes. In addition, some species of fish aren’t available in the demo. Dream Aquarium is a great virtual aquarium that doubles as a screensaver, but if you want to unlock all its features, you need to purchase the full version. Sim Aquarium offers high-quality 3D graphics, and it’s one of the better looking virtual aquariums. The application offers about 30 species of fish that you can add and about 10 different environments. The application has a useful stats manager on the left that will show you the number of specific fish in your aquarium. Each fish is 3D modeled and it looks amazing. Since this is a 3D application, it offers many settings related to video quality. In addition, you can also control the amount and speed of bubbles as well as the number of light rays. The application can also work as a screensaver replacement, so it’s perfect if you want a new soothing screensaver. Another feature that we have to mention is Live Wallpaper. This feature is available only in full version, and it will replace your current wallpaper with Sim Aquarium. This application offers great 3D graphics and a wide range of customization. We have to mention that only several fish species and two environments are available in the free demo version. Free demo version also doesn’t allow you to use Live Wallpaper feature, so keep that in mind. Sim Aquarium is a virtual aquarium with amazing graphics, and as a result, it might use a lot of your system resources. If you have an older PC, you might find that Sim Aquarium is to demanding on your resources, especially if you use it in Live Wallpaper mode. We also noticed that Sim Aquarium takes about 10 seconds to fully initialize every time you try to start it. This isn’t a major flaw, but it makes the application feel just a bit sluggish. Despite some minor flaws, Sim Aquarium is a beautiful virtual aquarium and we recommend that you download and try the free demo. Marine Aquarium is another virtual aquarium that also works as a screensaver. The aquarium offers great graphics and 28 fish species. Unfortunately, you’re limited to only one environment. Regarding the fish, this aquarium offers a wide range of customization. You can add specific fish to an aquarium, or you can use a random option that will always add different species of fish to your aquarium. The application also supports background music, which is a nice touch. If you want, you can change the background color of your aquarium or add a specific logo or a clock to it. In addition, you can also disable specific species of fish from appearing in your aquarium. Regarding the fish, you can see the name of each species along with its location, diet, and size. If you want, you can even create specific fish sets and toggle between them. The aquarium can hold up to 30 fishes, which should be more than enough for any user. 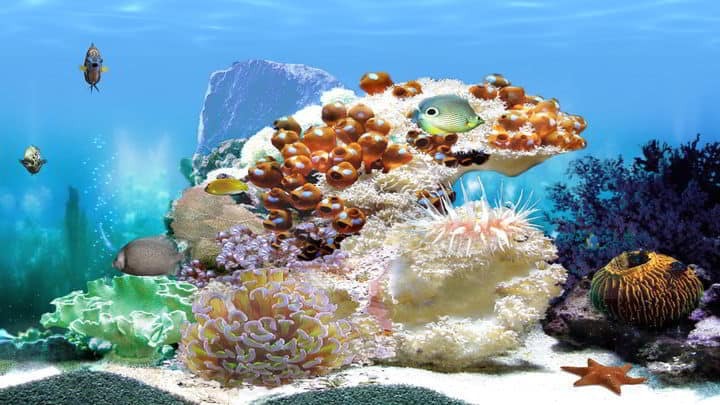 Marine Aquarium offers solid graphics and a wide range of customization. Unfortunately, you’re limited to only one environment which is the biggest flaw in our opinion. The free demo is available for download, but the demo version only has few fish species available. It’s worth mentioning that Marine Aquarium can also replace your screensaver with your virtual aquarium. Overall, Marine Aquarium is a solid virtual aquarium, so be sure to try it out. This virtual aquarium doesn’t have advanced graphics as some of our previous entries, but it offers a wide range of features. 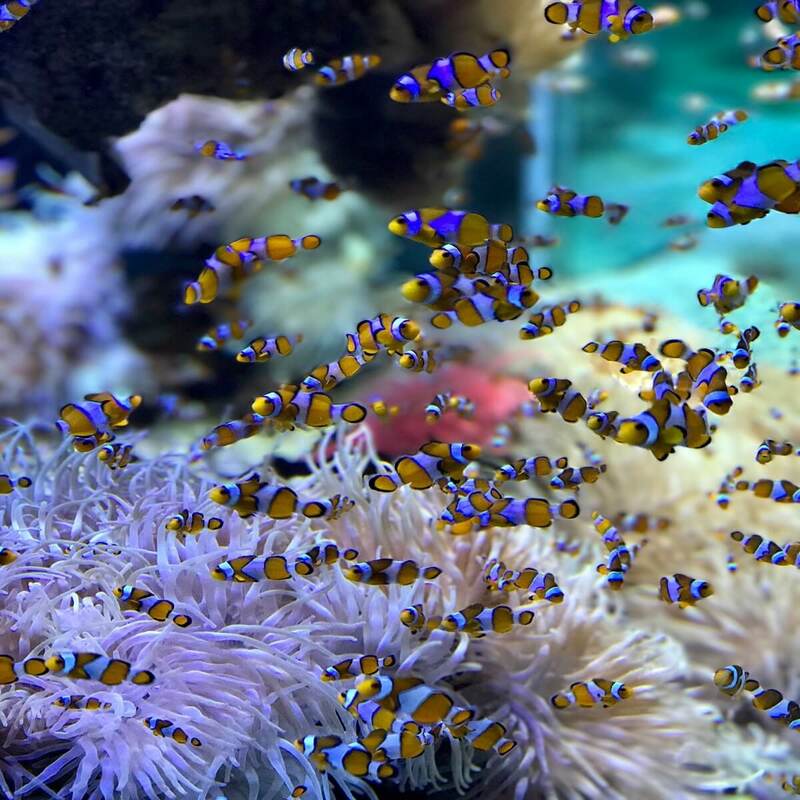 The aquarium supports saltwater and freshwater environments, and each environment has different species of fish available. The aquarium can have up to 100 fishes, which sounds impressive. We also have to mention that you can change the number of bubbles and switch between different backgrounds. The application also supports clock and calendar which can be useful to some users. It’s worth mentioning that this virtual aquarium can also work as a screensaver, which is quite useful. 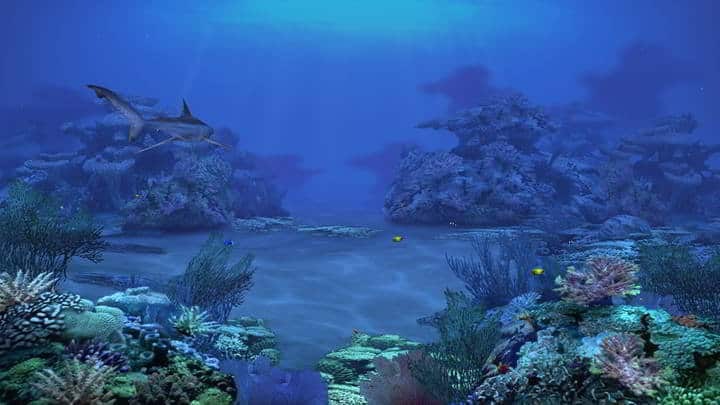 Although this virtual aquarium doesn’t offer the best graphics, it offers a wide range of features in the full version. The full version offers 25 types of fish and 6 realistic animated backgrounds as well as new animated underwater backgrounds. Most importantly, the full version lets you save your customization settings. 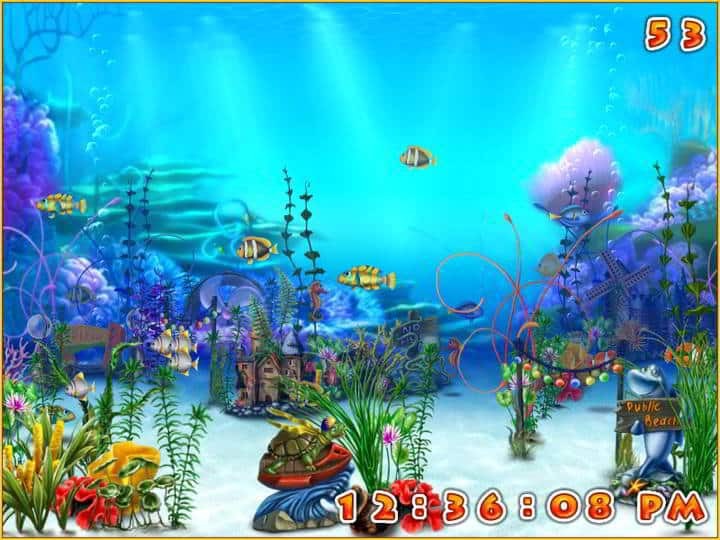 3D Fish School Screen Saver is a decent virtual aquarium with a wide range of customization. The visual aspect is probably the only flaw of this application, and we have to admit that this virtual aquarium looks a bit outdated compared to other entries on our list. This virtual aquarium offers great visuals, and it will allow you to add up to 10 fishes in your aquarium. Regarding the fish, the application supports about 20 different species, but you can also download more from the developer’s website. You can have random fishes in your aquarium or you can choose exactly which species you want to have. Amazing 3D Aquarium also supports different backgrounds, and you can choose the preferred background or use a random one. If you want, you can even download new backgrounds from the developer’s website. We have to mention that this application has a media player plugin so you can play your favorite music on it. Amazing 3D Aquarium works as a screensaver, but it also supports Live Wallpaper feature. Unfortunately, we didn’t manage to use this feature, so we assume that it’s available only in full version. Amazing 3D Aquarium offers solid graphics and decent customization options in the free version. If you want to get access to all features, you’ll have to purchase the full version. Goldfish Aquarium is a simple virtual aquarium with decent graphics. The application has high-quality fish models and static backgrounds that look a bit outdated. Goldfish Aquarium offers 16 species of fish and several different environments. Each time you start this application you’ll get a different environment, but you can also select preferred environments as well. In the demo version there are only three species available, and if you want to unlock the rest, you’ll need to purchase the full version. We have to mention that you can select your preferred fishes, but you can also have random fishes in your aquarium. Keep in mind that the free demo doesn’t allow you to have multiple fishes in your aquarium. 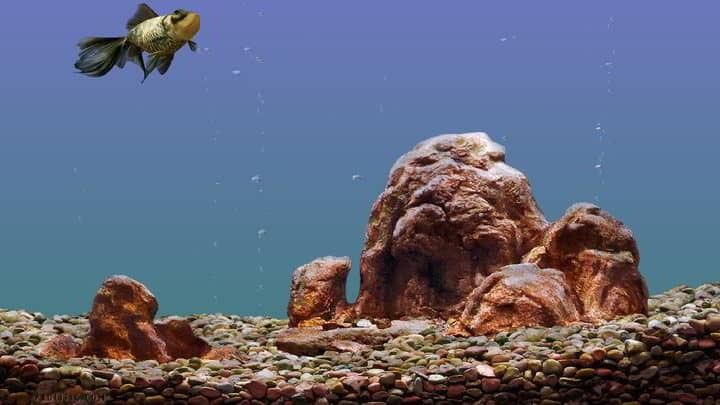 Goldfish Aquarium is a solid virtual aquarium screensaver, but if you want to unlock all its features, you’ll need to purchase the full version. Regarding the flaws, our only complaint is a bit outdated backgrounds that might turn away some users. This virtual aquarium offers great graphics and many features. This application has 26 different species of tropical fish. 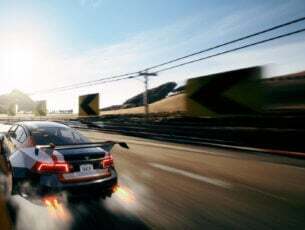 In addition, there are three different environments available. 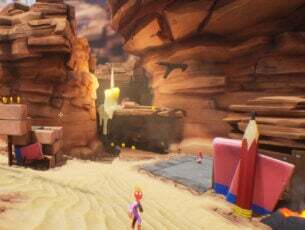 All environments feature coral reef and each environment looks amazing. In addition to fish, there are sea slugs and hermit crabs that will appear randomly on the bottom of the screen. We have to mention that each type of fish has a different behavior, and while some fish prefer to stay in groups, others will stay alone. If you have different types of fish in your aquarium, sometimes they’ll attack one another. 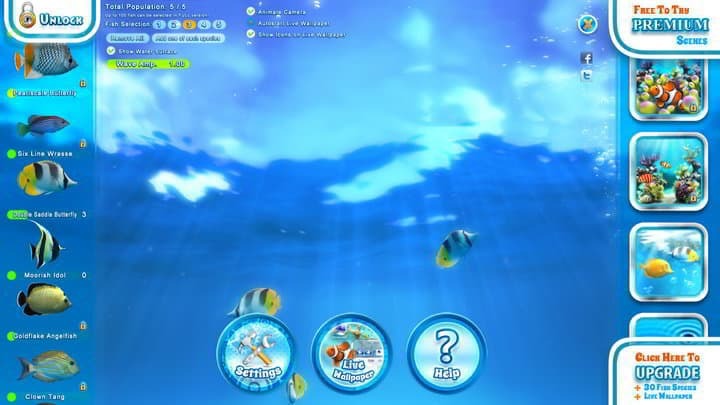 Aqua Real also allows a certain level of interactivity, and you can touch the fish to scare it. You can also add a shark to the aquarium in order to scare your fish. Aqua Real offers a wide range of options and it allows you to easily create a beautiful and realistic environment for your fish. It’s also worth mentioning that there’s support for music, so you can play your favorite tunes while virtual aquarium is running. Aqua Real can also work as a screensaver replacement, which is another plus. 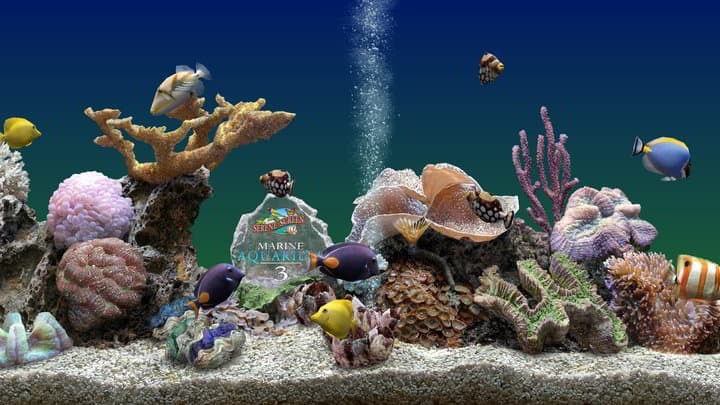 This is a great virtual aquarium, and it offers beautiful graphics and a wide range of options. We have to mention that the free version has only a few species available and a single environment. If you want to unlock all features, you need to purchase the full version. If you like sharks and other larger fishes, Sharks, Terrors of the Deep might be perfect for you. Unlike other applications on our list, this one only features sharks. Regarding the available sharks, there are 12 different species to choose from. The application also has three different environments to choose from. Regarding the limitations, you can have only one shark available in the demo version. If you want to add multiple sharks, you’ll need to purchase the full version. Sharks, Terrors of the Deep is a perfect virtual aquarium for all users that are fans of sharks. We have to mention that some backgrounds seem a bit outdated, and this minor flaw can turn away some users. This application has a colorful design, and it will be appealing to the younger audience. This is a simple virtual aquarium screensaver, and unlike other entries on our list, it doesn’t offer any advanced options. The application doesn’t allow you to choose the type of fish, which is a major flaw in our opinion. You can control the sound and sound effects, but unfortunately, you can’t add your own music. We also have to mention that you can’t change your environment, which is another flaw. Exotic Aquarium 3D Screensaver has a loading screen, and with its colorful design, it looks more like a video game than a screensaver. This screensaver supports digital clock, which is a useful feature. Regarding the limitations, you can view the screensaver for 60 seconds before the registration message appears. 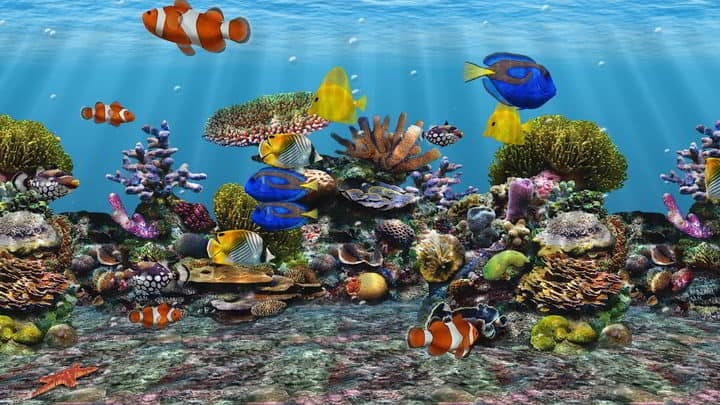 Exotic Aquarium 3D Screensaver is a humble virtual aquarium, and with its colorful visuals and lack of configuration, it will be appealing only to the younger audience. If you like fish and aquariums, be sure to try any of these virtual aquariums. Almost every application on our list can work as a screensaver, so if you’re looking for a new screensaver, feel free to try any of these applications.